It seems that the perfect smile is becoming ever more attainable for today’s population, with around a quarter of Britons having had some kind of cosmetic dentistry. Teeth whitening is a highly popular cosmetic treatment since it is a relatively simple, fast and affordable way of achieving a healthier looking smile. There are many teeth whitening treatments available, which can be done in-practice or with a take home whitening kit. However, one that stands out is Enlighten whitening, an advanced treatment that delivers whitening results of up to 16 shades. This treatment will definitely give you a brighter smile. Let’s take a look at what makes Enlighten the leader in tooth whitening and why you should choose Enlighten if you want whiter teeth. Claiming to provide the worlds’ best performing whitening treatments, the research laboratory behind Enlighten have formulated products which provide extremely effective results with the lowest concentrations. Enlighten Research Labs make known that they’ll only introduce a new system to the market if it represents a generational leap in effectiveness. This is a good sign for their professional tooth whitening system, which uses the best in technology to help dramatically lighten stained and discoloured teeth. So what makes Enlighten different? Enlighten combines at-home and in-practice whitening for the best results. What makes Enlighten unique is that it is the only system to guarantee Vita Shade B1 – the whitest shade on a regular dentist shade guide. And this applies to anyone, no matter your age or the existing shade of your teeth. This is great news for people who like their tea and coffee or red wine, as Enlighten will reduce staining and whiten beyond any other system. Enlighten uses ¼ less hydrogen peroxide than the standard whitening methods. Instead it increases the tooth’s permeability to oxygen, to break down staining and discolouration. 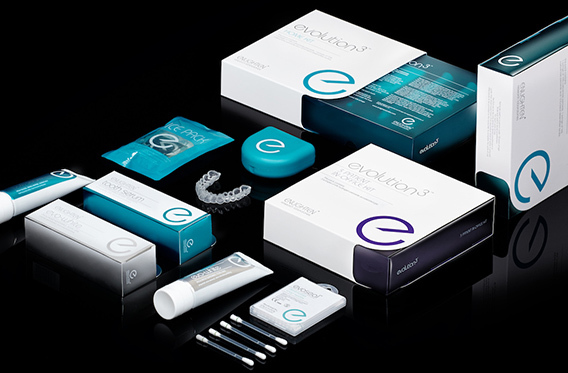 Enlighten is an innovative tooth whitening treatment which achieves a whiter, natural looking shade without being painful. 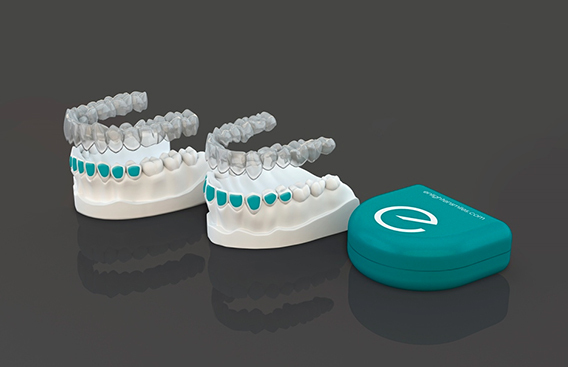 Although Enlighten uses proven science and advanced technologies, it uses materials that have been established in dentistry for more than a century. Since its whitening gel contains a lower concentration of hydrogen peroxide, the treatment won’t damage your teeth or your gums. Enlighten whitening is extremely effective, giving long-lasting results of around 3 years or more with the right care. The first step is for one of our dentists to take impressions of your teeth so that they can be made into custom moulds. These will take a couple of weeks to be made in the Enlighten laboratory, then you’ll need to schedule in a second visit to collect them and learn how to use your home whitening kit. Your home whitening treatment will involve you filling your moulds with the Enlighten whitening gel and wearing them overnight, for two weeks. After the first week, you’ll need to switch to a stronger gel for the top whitening results. If you do feel sensitivity, you can use Enlighten’s anti-sensitivity product to minimise discomfort. This is included in the Enlighten kit. Once you’ve completed the take home treatment you’ll finish off with a 60-minute in-practice whitening session. The end results will leave you with teeth up to 16 shades lighter depending on your preferences. You new bright smile can be topped up at home, as you can wear the trays for one night every other month. Enlighten also provides an expert Tooth Serum which can be used when brushing your teeth, to keep your smile looking dazzling. We can suggest an appropriate maintenance suitable to your individual needs. Enlighten is our ‘Gold Standard’ whitening treatment. The all-inclusive procedure is £495. Enlighten is also available as a home use only kit. This is our ‘Silver standard’ option and costs £395. We also offer Zoom whitening from Philips – This comes as a simple to use home tray whitening kit. This can be suitable for people who require less in depth whitening and is our ‘Bronze standard’ whitening option. This is available for £295. Just ask your dentists which is most appropriate for your needs and we will happily advise you of the right choice for you. If you need any further information or to book a consultation? Contact us today!